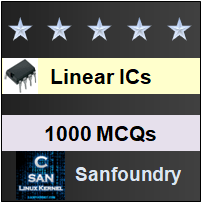 This set of Linear Integrated Circuit Multiple Choice Questions & Answers (MCQs) focuses on “Multiplier and Divider – 1”. 1. 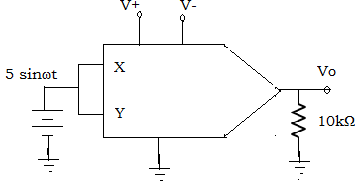 Determine output voltage of analog multiplier provided with two input signal Vx and Vy. Explanation: The output is the product of two inputs divided by a reference voltage in analog multiplier. Thus, the output voltage is a scaled version of x and y inputs. => Vo =Vx ×Vy / Vref. Explanation: If both inputs are positive, the IC is said to be a one quadrant multiplier. A two quadrant multiplier function properly, if one input is held positive and the other is allowed to swing. Similarly, for a four quadrant multiplier both the inputs are allowed to swing. 3. 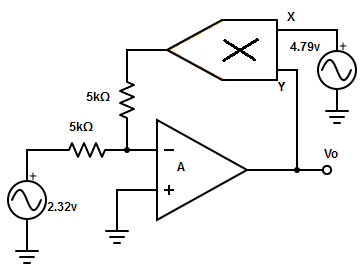 What is the disadvantage of log-antilog multiplier? 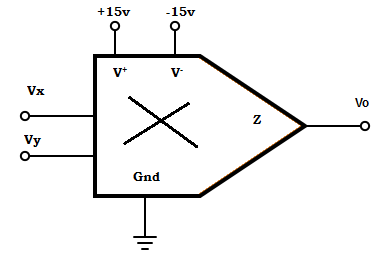 Explanation: Log amplifier requires the input and reference voltage to be of the same polarity. This restricts log-antilog multiplier to one quadrant operation. 4. An input of Vsinωt is applied to an ideal frequency doubler. Compute its output voltage? a) Vo = [(Vx×Vy) /Vref2] × [1-cos2ωt/2]. b) Vo = [(Vx2×Vy2) /Vref] × [1-cos2ωt/2]. c) Vo = [(Vx×Vy)2 /Vref] × [1-cos2ωt/2]. d) Vo = [(Vx×Vy) /( Vref] × [1-cos2ωt/2]. Explanation: In an ideal frequency doubler, same frequency is applied to both inputs. => Vo = (Vx×Vy × sin2ωt) / Vref = [(Vx×Vy) / Vref] × [1-cos2ωt/2]. Vo = [5×(sin2π×104t)2 ]/10 = 2.5×[1/2-(1/2cos2π ×2×104t)] = 1.25-(1.25×cos4π×104t). 6. Calculate the phase difference between two input signals applied to a multiplier, if the input signals are Vx= 2sinωt and Vy= 4sin(ωt+θ). (Take Vref= 12v). => cosθ = (10×2×12)/(2×4) = 30. => θ = cos-130 =1.019. Explanation: The output voltage of the divider, Vo= -Vref×(Vz/Vx). Where Vz –> dividend and Vx –> divisor. Explanation: Division is the complement of multiplication. So, the divider can be accomplished by placing the multiplier circuit element in the op-amp feedback loop. 9. Find the input current for the circuit given below. Explanation: Input current, IZ = -(Vx×Vo)/(Vref×R) = -(4.79v×16.5v)/(10×5kΩ) = 1.581mA. 10. Find the condition at which the output will not saturate? Explanation: In an analog multiplier, Vref is internally set to 10v. As long as Vx < Vref and Vy < Vref, the output of multiplier will not saturate.